Hypsirhina jagorii – Günther, 1864, The Reptiles of British India, p. 282. Enhydris jagorii - Smith, 1943, The Fauna of British India…. Reptilia and Amphibia 3:384 (in part). Enhydris chanardi Murphy and Voris, 2005 Raffles Bulletin Zoology 53:144. Type Locality: Bangkok, Thailand. Holotype: USNM 67516, a female collected 1 May 1928 in Bangkok (13°45’0N 100°31’0E), Thailand Collector: Hugh B. Smith. This snake was named in honor of Thai herpetologist and Bangkok resident Tanya Chan-ard. All specimens of this snake come from metropolitan Bangkok or the surrounding area. Locality data often includes comments like, “rice fields of Bangkok” (CAS135735), “near Bangkok” (UMMZ65336), or “purchased in Bangkok market,” (LSUMZ 16922). Flower (1899) obtained three specimens in Bangkok and one (BMNH 97.10.8.28) at “Takhamen.” I have been unable to locate a place with this name in Thailand, but there is a Ta Kam (13°37’60N 100°27’0E) (also spelled Takam) just west of Bangkok. Another specimen was collected by H. B. Smith at Ban Pan on the Sikuk (or Sikut River) I have been unsuccessful in locating this village and river. A specimen that came from some distance from Bangkok is BMNH 1987.1748, from Chanthaburi (12°35’60N 10°29’0E). This location is in the Coastal Ranges to the southeast of Bangkok and suggests the species may be more widespread than the immediate Bangkok metropolitan area. It is also of interest because this specimen has the lowest ventral scale count and subcaudal count of any of the specimens examined. Enhydris chanardi is endemic (or a near endemic) to the Chao Phraya freshwater swamp forest of the Indochina Bioregion of Wikramanayake et al. (2002). Enhydris chanardi can be distinguished from all other Enhydris with 21 scale rows at midbody by the combination of the following characteristics: 116 - 125 ventral scales, 41 - 60 subcadual scales (53 - 60 in males and 38 - 49 in females); two pairs of chin shields with the second pair being the longest or equal to the first pair; an interocular distance that is greater than the length of the frontal; scales that are longer than tall on rows 7 - 15; lateral spots on rows 4 - 5 or 4 - 6; and a stripe on scale row three. Dorsal scales of this species lack the striations found in E. enhydris and E. subtaeniata; the ventral count will also separate this species from E. enhydris, and E. subtaeniata. The 21 - 23 rows of dorsal scales on the neck, the stripe on the outer edges of each ventral and scale rows 1 - 3 will distinguish it from Enhydris innominata, E. longicauda, and Enhydris jagorii (includes E. smithii), as will the long second pair of chin shields. The scale counts on this species are extremely close to those of the sympatric Enhydris jagorii; the color patterns of these two species are quite distinct and head shapes (jagorii has a narrow, rounded snout, while chanardi’s snout is broad and square), and chanardi has 21 - 23 (usually 21 or 22) dorsal scale rows on the neck, while jagorii has 23 - 25 scale rows on the neck. Additionally, E. jagorii has a frontal that is equal to the length of the parietal, while chanardi has a frontal that is shorter than the parietal scales. Size: The largest specimen measured was a female with a total length of 547 mm, and a 101 mm tail. The largest male was 524 mm in total length with an 87 mm tail. The other specimens examined were 270 - 380 mm SVL; with 72 - 96 mm tails (the smallest individual has a broken tail). The tail is 19 - 26% of the SVL in females, and 26 - 30% of the SVL in males. The head is depressed and distinct from the neck. The body is cylindrical at midbody and becomes strongly compressed posteriorly. The tail is also strongly compressed. On the head the rostral scale is pentagonal and 1.8 times broader than tall. Divided or semi-divided nasals have a cleft touching first labial and the internasal in most specimens, and only the first labial when it is semi-divided. Each nasal is slightly larger than the eye’s diameter. The internasal is posterior to and slightly penetrating the nasals. The internasal is as broad as the supraocular is long, and contacts the loreal in all of the specimens examined. The prefrontal scale is divided and in contact with the loreal and preocular, and has a diameter slightly less than that of the eye. The supraocular is single and about equal in length to the width of the internasal; the preocular is single; the postoculars number two, with the dorsal scale slightly larger than the ventral scale. There is no subocular; the fourth upper labial enters the orbit. The frontal is about equal in length to the interocular distance. Upper labial scales number eight (rarely nine), and are not divided, the fourth enters the orbit, and 1 - 3 contact the loreal. The largest (tallest) upper labial is number six. The temporal formula is 1 + 2 + 4 or 1 + 2 + 3. The primary temporal is slightly broader than tall. The secondary temporal scales number two and the upper scale is larger than the bottom scale. See Figure 26. On the chin the lower labials number 10 - 12, the first four or five contact the anterior chin shield. The largest lower labial is number six or seven. The labial immediately posterior to the largest labial is elongate, but narrow. There are two pair of chin shields, with the two pairs about equal in length, or the second pair is slightly longer than the first, but the first pair is larger in area and flared or petal-shaped. The first four or five labials touch the first pair of chin shields. On the body the dorsal scale rows number 20 - 23 on the neck (usually 21) and 21 at mid-body, and may be reduced to 19 posteriorly, or remain at 20 or 21 rows. The scales in the first row are about 20% larger than the scales in the second row. The dorsal scales in the lower rows (1 - 3 or 1 - 4) particularly towards the posterior of the body are very ovate; these become more lanceolate toward the vertebral line. The ventral scales are wide, about 3 times the height of a nearby dorsal scale, and they number 110 - 122 in males and 116 - 125 in females. Subcaudal scales number 53 - 60 in males and 41 - 51 in females. 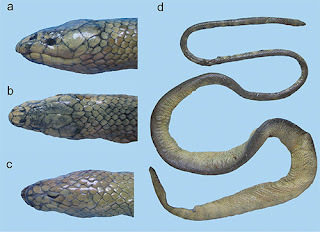 However, one male from Chanthaburi has 44 subcaudal scales suggesting that females from this population may have a lower numbers of subcaudal scales than those from the populations sampled above.